GALION — For the first time in a long time, the Galion Tigers cross country teams will head out into battle without George Guins as their leader. Guins retired after last season, his 49th as a cross country coach. To say that new head coach Cindy Conner, Guins’ assistant for five years, has some big shoes to fill would be an unfair statement. Connerwho will be joined by assistant coaches Carson Early (third year), Jamie Tate (fifth year), Elizabeth Volz (second year) and Alan Conner (first year). So, to start the Conner-era at Galion, the new head coach will return numerous varsity letterwinners on the girls and boys teams. Conner, a part of the team from a season ago that finished as the county runner-up to Colonel Crawford, finished fourth in the Mid-Ohio Athletic Conference and took eighth at districts, will be joined by Airyona Nickels, vying for her second letter. Nickels earned an all-county nod last fall for her performances. She placed second at the county meet, ninth in the MOAC, 16th at districts and 26th at regionals. Despite losing Cheyenne Blair, Ashlie Sallee, Murissa Windbigler and Teresa House to graduation, Conner and Nickels will still be in good company in 2018, according to their coach. On the boys team, Galion will be without 2017 graduates Luke Eisnaugle and Nate Eckert, but have a returning runner who deserves a lot of attention this fall in Braxton Tate. Tate joined Nickels on the all-county team last season, and was also a first-team member of the all-conference squad after a runner-up finish to Zach Kreft at the MOAC meet last season. Tate also took runner-up honors in the county meet, sixth at districts, seventh at regionals and clocked in at 57th in the state meet in his sophomore season. Joining Tate for the boys are returning seniors Brenden Ganshorn, Mikey Stover and Kurt Ensman as well as underclassmen Garrett Murphy and a group of sophomores in Braeden Horn, Hunter Parsley, Simon Shawk and Zach Slone. The boys team looks to improve further from their county runner-up finish, fourth place finish in the league and 10th overall finish at districts in 2017 and will use their youth — paired with experience — to do so. Galion will start their run toward success Tuesday, Aug. 21 at the Upper Sandusky Invitational. The Tigers will not be on their home course for competition until Saturday, Sept. 15 when they host the annual Galion Cross County Festival, one of the largest meets in the state. The following week, both the girls and boys teams will seek to dethrone the squads from Colonel Crawford for the county hardware in the Crawford County Meet at Amann Reservoir Park. The Galion cross country teams spend several weeks this summer collecting shoes from the community and Conner is appreciative. 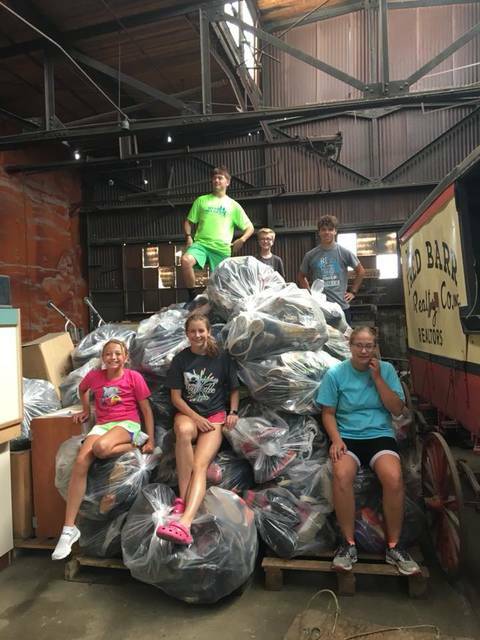 Members of the Galion Tigers cross country team pose with their shoe drive collections that helped to send 10 of the student athletes to cross country camp. 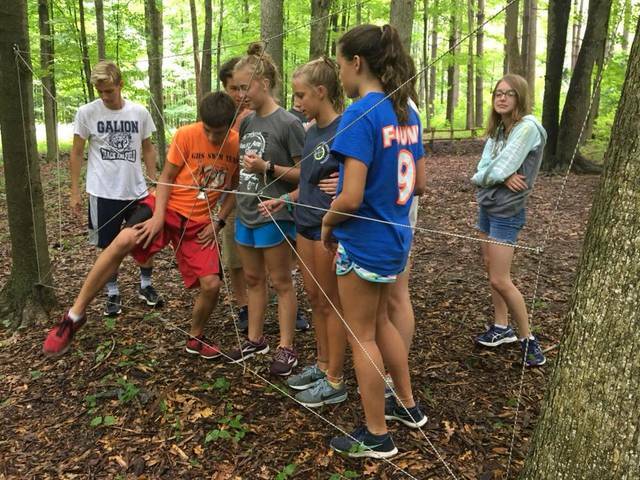 While at the camp, the Tigers XC members participated in many team building activities to strengthen the bond between one another. 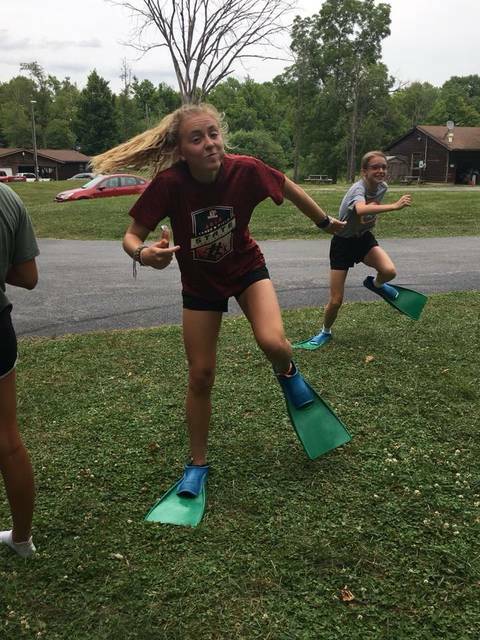 One of the activities that the cross country team took part in at the camp was the flipper race that they came up with. Pictured is four-year varsity letter hopeful Sari Conner, showing off her flipper form.